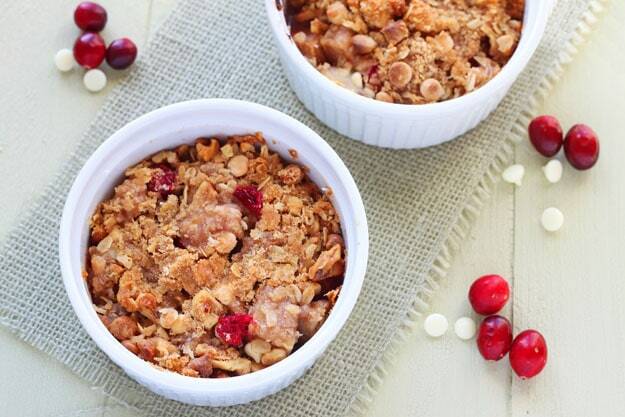 Got leftover cranberries? Yeah, me too. After cooking the entire Thanksgiving meal, I’ve got more leftovers and produce in my fridge than I ever thought possible. Luckily, Kathleen King to the rescue again with another recipe from Baking for Friends. I halved her small recipe for pear cranberry crisp studded with chocolate chips to come up with a dessert for two version. I swapped white chocolate chips for the semisweet and gobbled up this sweet crispy bowl of deliciousness. Cranberries and white chocolate were meant for each other. Stay tuned on that combo, my friends. I hope you entered my giveaway (don’t worry, there’s still time to enter ’til next Monday). But but but, I have another treat for you! If you want to buy Kathleen’s latest book, I have a nice coupon code for you: enter ‘BAKEOFF’ and you’ll get $5 off your order here. Trust me, you need this book in your entertainment repertoire. Preheat the oven to 375. Have ready 2 10-ounce ramekins (or 4 small 5-ounce ramekins). In a medium bowl, stir together the cranberries, diced pears, sugar and vanilla. Divide the mixture between the ramekins. 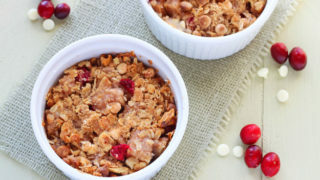 In the same bowl, combine all the ingredients for the streusel topping except the walnuts and white chocolate chips. Use your fingers to rub the butter into the dry ingredients and create coarse crumbs. Next, work in the walnuts and chocolate chips. Divide the crumb mixture between the ramekins. Bake the ramekins on a cookie sheet for 25-30 minutes, or until the top is golden brown and the fruit is bubbling. Such a lovely idea to use pear – I’ve seen a lot of apple and cranberry recipes recently but this sounds so interesting (especially with the addition of the white chocolate chips!). Pear and cranberries sound wonderful and this looks wonderful! What a gorgeous, seasonal dessert! I love fruity crisps and strangely enough, my manly boyfriend prefers fruit crisps and crumbles over heavy chocolate/creamy treats, so this is definitely a recipe we would both enjoy! 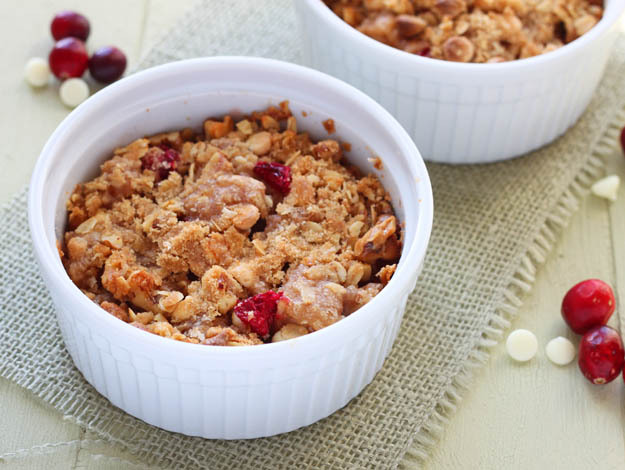 I’ve never made a baked treat using cranberries, so I’m excited to try this!! I literally have every.single.ingredient – that means it’s meant to be, right? I didn’t make cranberries for Thanksgiving this year, Christina, because there’s only two of us and I didn’t want a bunch of leftovers. Silly me. Now I know what to do with them, thanks! this looks lovely my friend, love cranberries this time of year. this looks delicious! I love how vibrant the cranberries are in the dish! I love cranberries and white chocolate! I can only imagine how good that combination would be with pears in a crisp! Lady, I was going to make cranberry sauce with the little bit of totally expensive cranberries I have. You just ruined my plans! btw, I’m so going to add coconut flakes in mine. I made these for breakfast and they were wonderful. Now I need more. Ok, where I have I been? I’ve never really thought to make a crisp out of cranberries…AND add white chocolate. I think it’s brilliant. Love it, Christina!